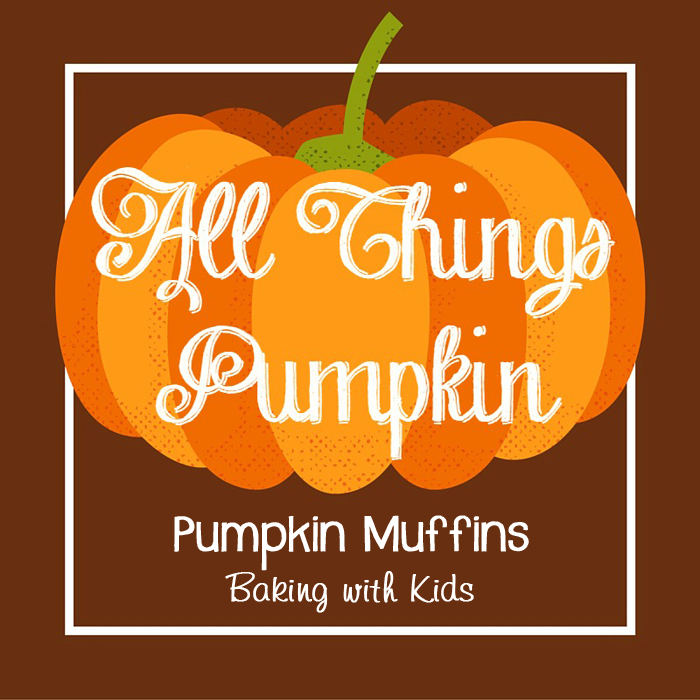 Who's ready for our first "All Things Pumpkin" Party! 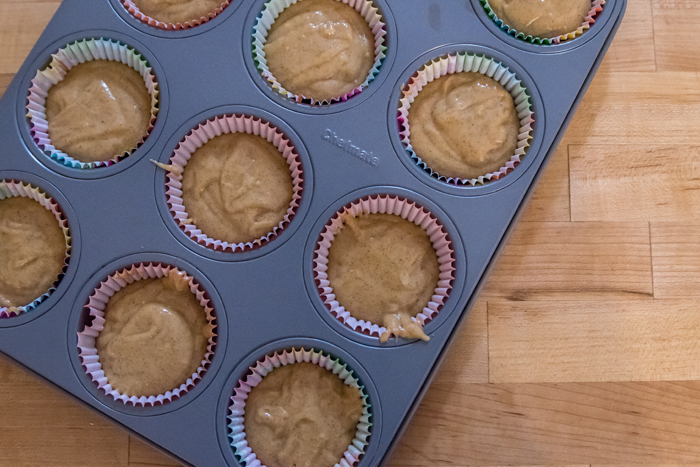 I decided to start the party off with some pumpkin muffins and some baking tips. 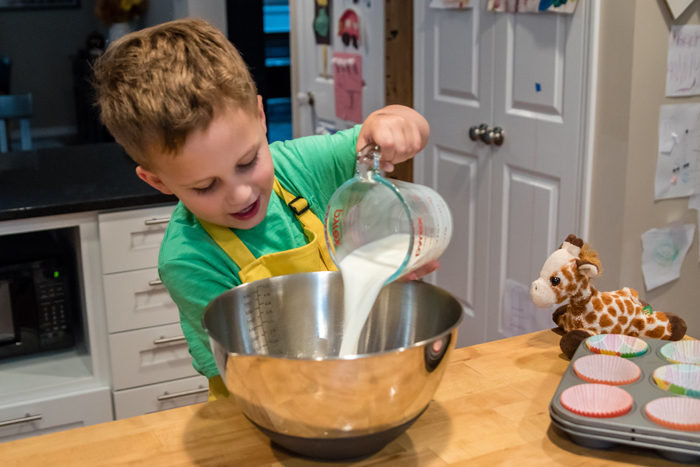 I love to bake, and ever since Noah was 2, I've had him help me. From the very beginning, Noah has been very interested in the entire process. While it would probably be easier and cleaner to bake on my own, I absolutely love that he helps me. And after all this time, it now feels weird to bake without him. 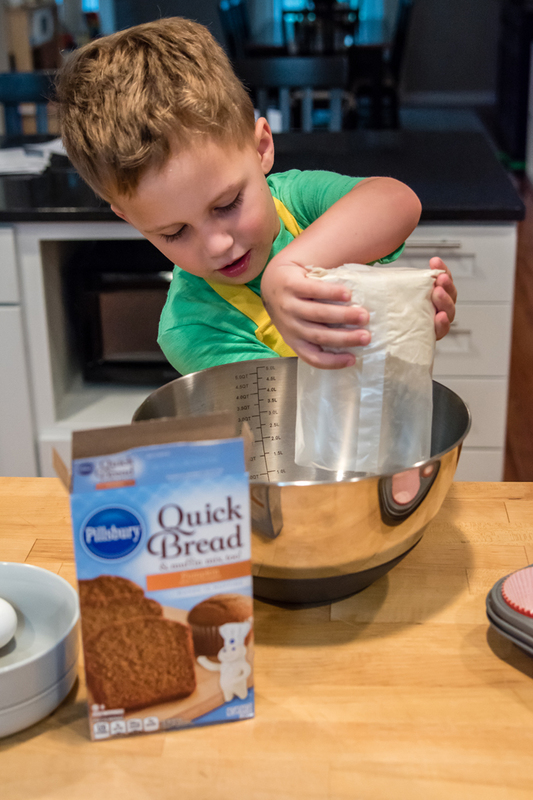 Here are some tips I've learned along the way to make baking with kids a little easier. Noah's been baking with me for almost two years now. And while he's become a real help now, it didn't happen over night. 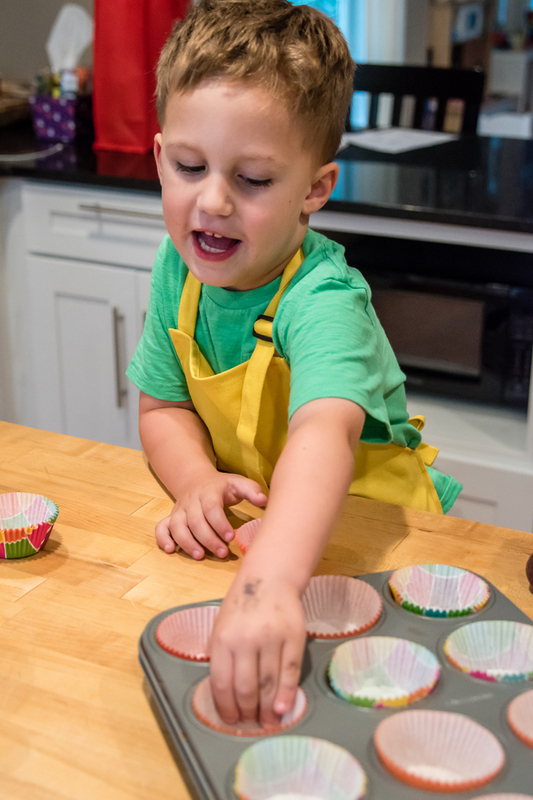 In the beginning, I would have Noah help with the simple and non messy things, like putting the muffin liners into the baking tins and helping me mix with the spoon. As he got older, I would have him help measure things out and pour them into the bowl. I always stay close by to make sure we get the correct measurements, but he loves having more independence in the process. When we make banana bread, he's in charge of mashing the bananas. When we make our apple zucchini muffins, he grates the zucchini. I have a grater that is very foolproof and just requires turning the handle like an old school classroom pencil sharpener. Noah has gotten so good at it that I can cut the zucchini into small pieces and he does the rest. But you better believe that I took my time in giving him more and more responsibility. It just so happened that Noah started baking with me when I was making a lot of muffins and cookies from scratch. I have nothing against using mixes from a box, it was just that I had found a few recipes that I really liked and kept making them over and over. So Noah became really used to taking the flour and sugar and spices out. 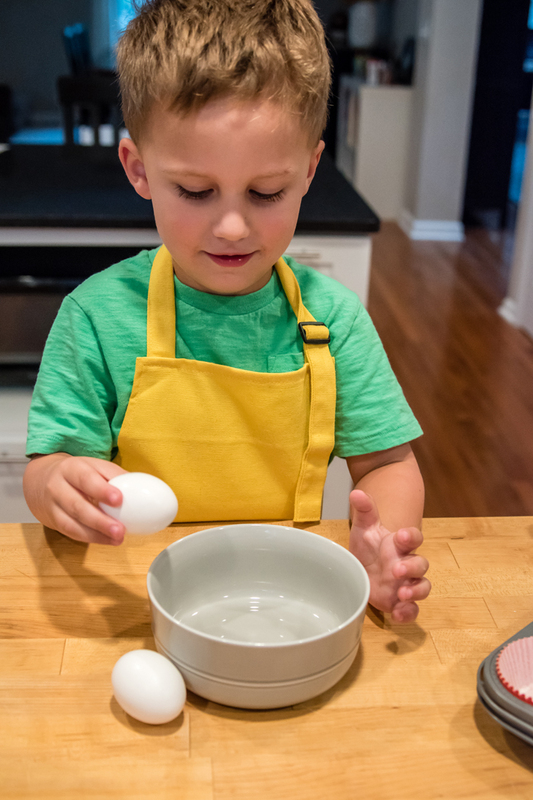 While it takes more time, I find it's easier for a child to help measure the dry ingredients than it is to have them help measure milk and oil and to help crack eggs. 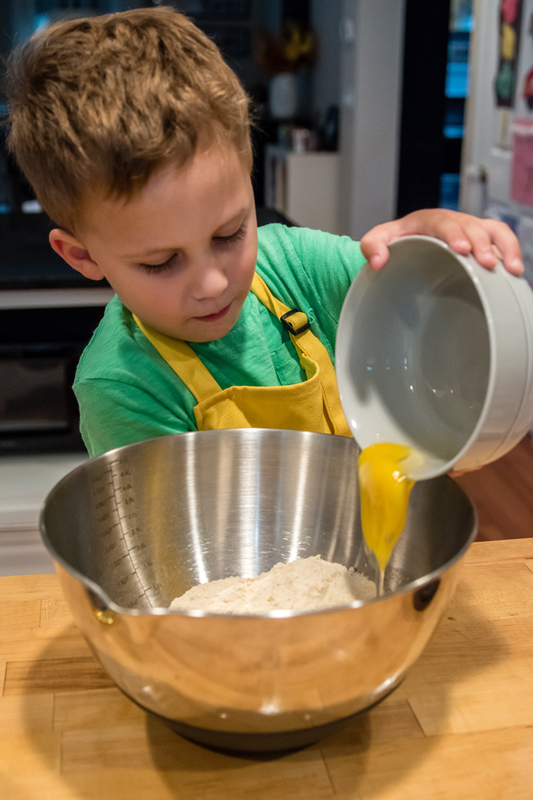 So while mixes are really easy to use, Noah gets to help more when we bake from scratch. So while I don't hesitate baking from scratch, I do avoid making really complicated recipes with Noah. No one will have any fun if you are going to get annoyed if your child makes a mistake. This time though, we made pumpkin muffins from a mix. 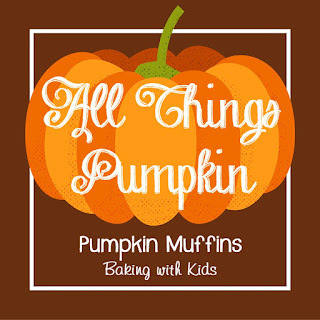 I have never been a pumpkin fanatic, but we had these pumpkin muffins at a friend's house and we both LOVED them. I think Noah ate 3 in a row! I asked her for the recipe and was pleased to find out they were from a box... makes it even easier! I added it to my grocery list and was excited to make them with Noah. He was rather surprised though when I told him we didn't need to take out all of the containers of flour, sugar, and spices. Just the mix, some milk, oil, and eggs and we were done! I measured out the liquid ingredients and helped Noah crack the eggs, but other than that, I let him do everything else on his own. I think one of the reasons Noah likes helping me bake so much, is that he gets to be just like me. It's no secret that kids like to imitate adults, especially their parents. So when Noah became my baking buddy, I made sure to get him some tools that were all his own. We already had the stool which he uses ALL THE TIME! We have one in the bathroom to help wash his hands as well as in the kitchen so he can reach the counter. He's quick to grab the stool and bring it to wherever he needs it. In addition to making him the right height, I also got him an apron and spoon in his favorite color (at the time). While not necessary, I definitely think it helps make it a fun experience. 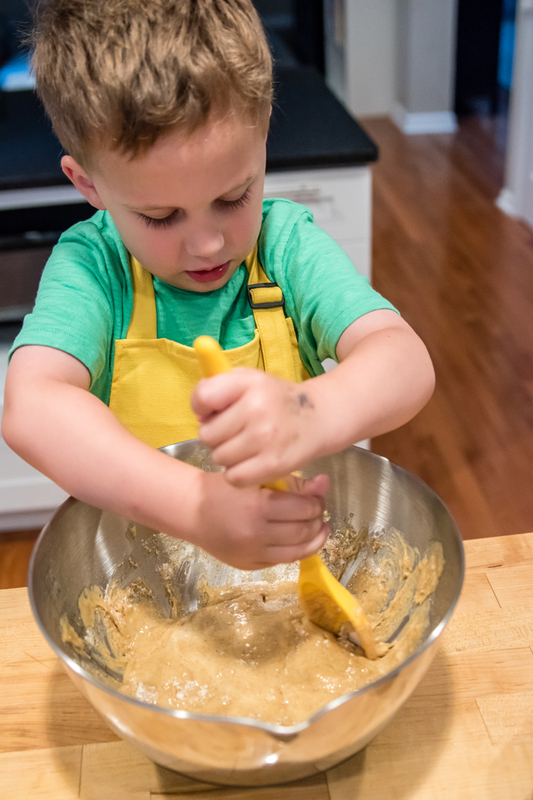 While I'm not a fan of messes, I try to relax and go with the flow when baking with Noah. Noah's naturally a neat kid who follows instructions well, but spills still happen. If you go into it knowing you will have a little extra cleanup and it will take a little longer, I think you will have a better baking experience. It's true what they say that attitude is everything. I try to teach Noah that while baking is fun it's still very important to listen and follow directions. 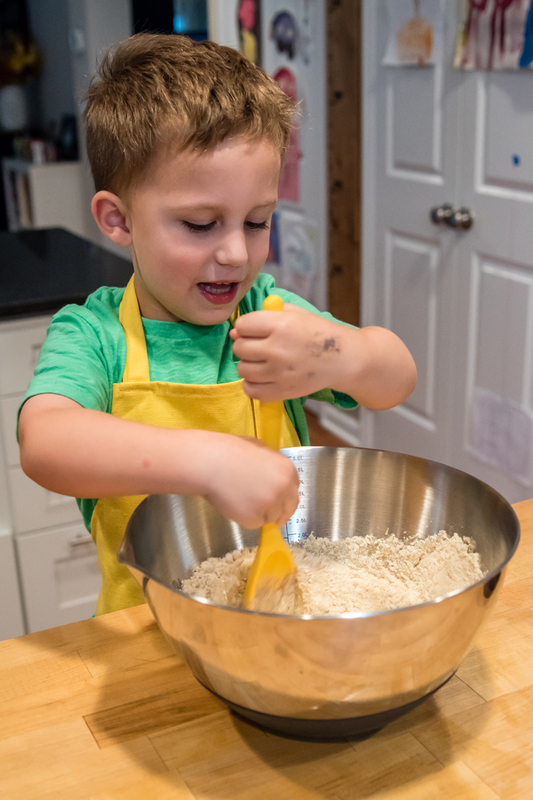 Noah knows that he must wash his hands before we start, that he has to be careful with the ingredients (while spills happen, Noah knows that we don't purposefully make messes), and that the oven is hot and that once it goes in the oven, it's my job. He's also learned some math skills through measuring and some basic kitchen safety skills. I'm all about learning while having fun! I really do enjoy baking with Noah. I love that we get some quality time together without any distractions. But one of my favorite parts is to see how proud he is of the finished product. He's always eager to tell anyone and everyone that comes over that he helped make them. An extra bonus is that I find Noah is more apt to try a new food if he helped make it. 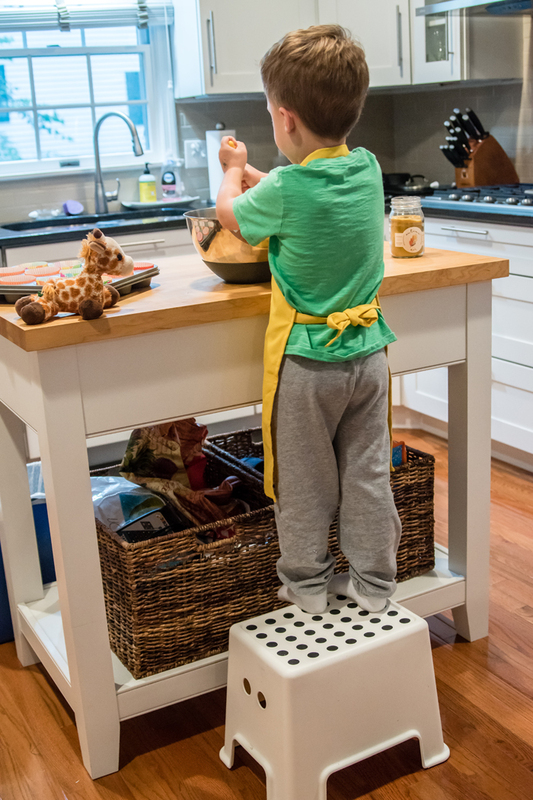 It's easy to forget that our kids are fully capable of helping with basic kitchen tasks. By helping me bake, I'm constantly reminded how grown up and independent he's becoming! 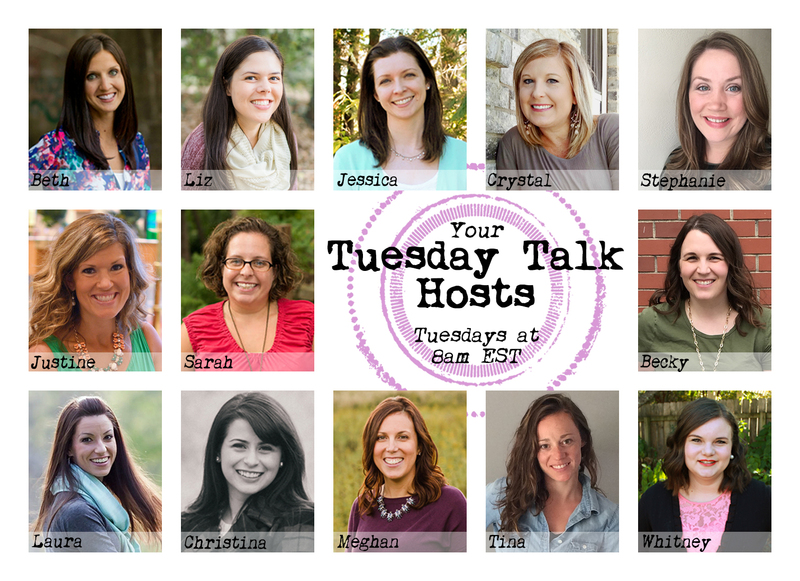 Do your kids help you bake? Do they enjoy it? Noah looks like he's having a blast baking. So focused too. Cam will help for a while, but looses interest. Emmy is gonna be my helper I think. She's all about it, hence how she almost broke my mixer last week. Ha ha! So sweet. I love that you bake with Noah it is always a little more time consuming and messy but the memories are so fun. I am so glad that you, Stephanie and Beth are sharing all of the recipes because I am not the greatest in the kitchen! I mean, I can follow a recipe…sometimes. Ha. I love that Noah got in there and helped you! How fun! 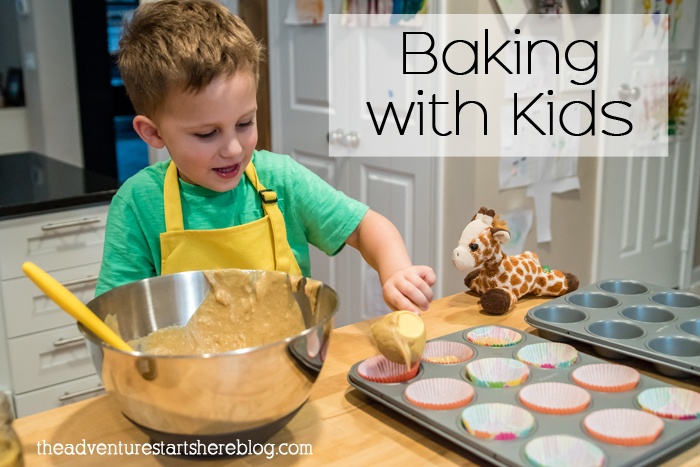 These are great tips for baking with kids. I just adore sweet Noah and can’t get enough pictures of him. 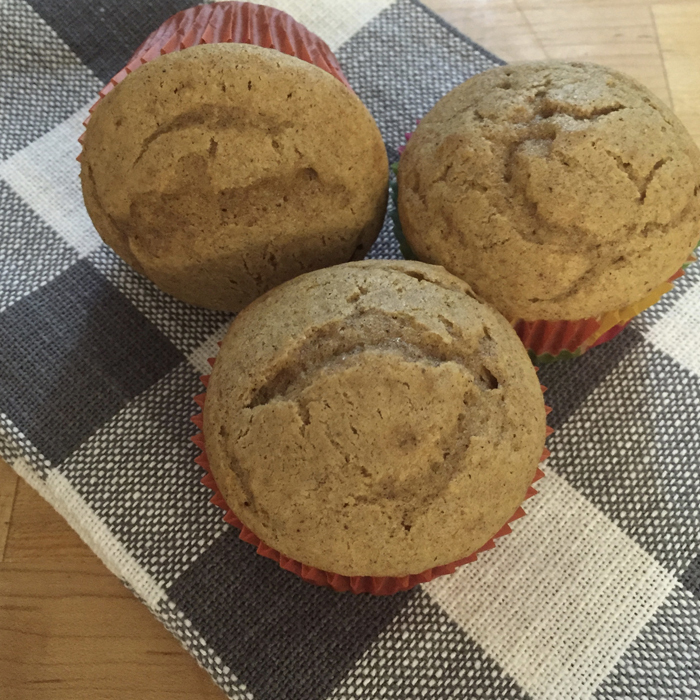 I am going to have to try these muffins and maybe get Mason to help! I am envious of Noah's love for the kitchen. Connor doesn't really want to help but you've just inspired me to get him in there with me more. These are great tips! I love getting my boys in the kitchen with me! Noah looks like a pro! I want to get some matching aprons for me and the girls, what a great touch! Gotta love the ease of a box mix when pressed for time. Your Noah is so cute, and that is wonderful that he likes to bake. My son is almost 13 and still loves to be in the kitchen.